JOHN ROCK COMPANIES – John Rock, Inc. The John Rock, Inc. facility is not just any building. It is the culmination of a long sought after dream. This building is a highly designed multi-function operation with a pinpoint focus that allows Bill’s guiding principle “Be the Best” to come to life. Outside you can find one of the nation’s largest heat treatment/sterilization chambers, a truck, trailer & forklift maintenance facility, a trailer staging yard, the wood waste grinding operations, sawdust and mulch storage, the “used pallet” sorting and storage yard and the largest raw material lumber yard anywhere. 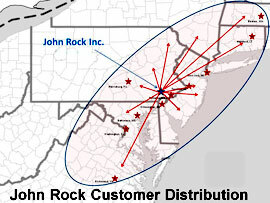 John Rock, Inc. is centrally located in eastern Pennsylvania, the prime geographical position for quickly and efficiently servicing the Mid-Atlantic and lower New England regions and the largest industrialized manufacturing corridor in the United States if not the world. This region includes a wide range of industries, such as petrochemical, pharmaceutical, automotive, technology, clothing, new construction, as well as food manufacturing, all requiring wooden pallets to conduct business. In addition to being close to the customer base, this prime location also allows John Rock to take advantage of the significant and plentiful certified sustainable Appalachian forest regions of Pennsylvania, Virginia, West Virginia and Maryland. Having access to this large hardwood region gives John Rock creative and cost-effective opportunities for sourcing raw material unavailable elsewhere in the country. Rock Technologies is the trucking division of John Rock Inc. With a fleet of over 50 power units and 300 trailers including flatbeds, drop decks and van trailers for hauling, pallets, lumber and backhauls of various items. Over the past few years erratic energy costs have complicated an already difficult market. Transportation of products for all industry has become a major hurdle to overcome. Rock Technologies was formed as the transportation arm of John Rock Inc. to deal with these emerging challenges for John Rock and our customers. 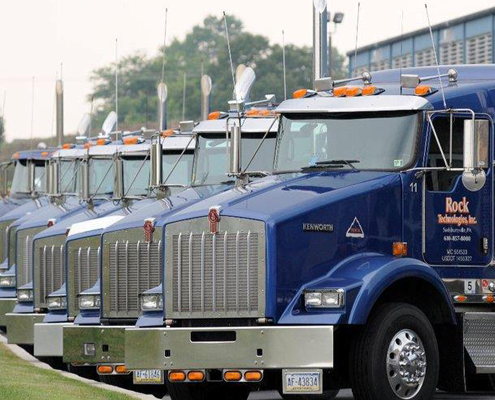 By maintaining complete control of our fleet, we can directly coordinate every order to ensure timely delivery to our customers. 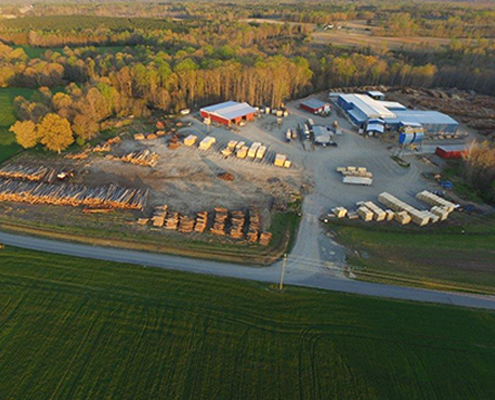 The primary focus at this sawmill is purchasing hardwood timber ranging from pallet logs on up to the highest quality veneer logs. 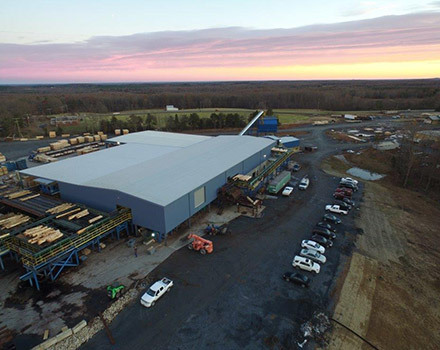 This mill location makes hardwood flooring, pallet lumber, railroad ties, and furniture grade lumber. Having developed relationships with a wide array of customers we ship lumber throughout the east coast. These established markets allow us to be extremely competitive in all aspects of timber procurement. The primary interest at this mill is hardwood timber for industrial lumber production. 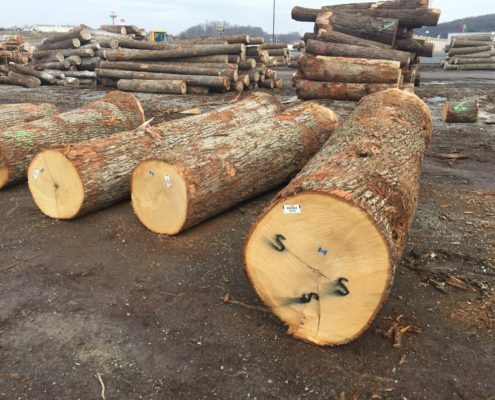 A large portion of the timber that is procured for this site are pallet logs and tie logs. 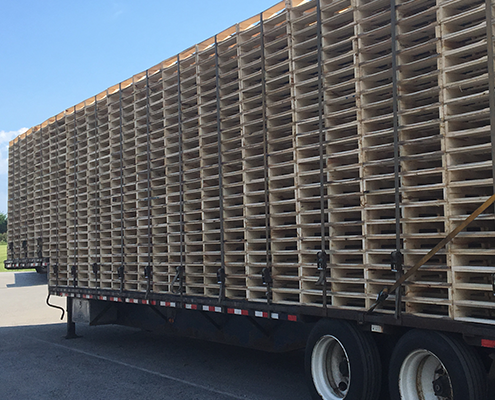 This helps to service the lumber needs of the pallet manufacturing plant in Pennsylvania, where lumber is shipped throughout the east coast, allowing them to be extremely competitive in all aspects of timber procurement. 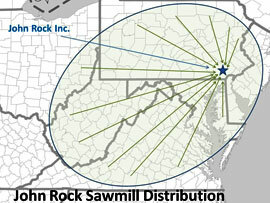 Rock Hardwoods, located in Raphine, VA, exports, buys and sells high quality veneer and sawlogs. This yard team can sort logs to length diameter and color specifications to help maximize yield. They also sort logs for slicing or sawing. Rock Hardwoods offers all Hardwood and Softwood species, ensuring that quality products begin with the Rock Hardwoods team. Log Specialist, Bradley Moore, has 15 years experience grading logs for specialized products.